Such shows as “Kids Say the Darndest Things” and “Seriously Funny Kids” capitalize on the hilarious, wacky, and interesting things that kids say. The American Sandbox Dictionary of Children’s Mispronounced English is the book form of these shows. With such mispronunciations as "Rockatwobama" (Barack Obama) and "incarpeter" (interpreter), this book is as funny as it is entertaining. My family and I had a blast reading this book. From "hippobottomless" (hippopotamus) to “My spagheeto bites won’t stop itching!” to “Mom, can I have scramboiled eggs?”, it’s an easy read for anyone and is written out just like a standard dictionary, only far more entertaining. There is even a place at the end to write down your own children’s cutest mispronunciations. This would make a great gift for anyone with children in their life and is sure to make anyone laugh hysterically because of how “adorabubble” it is. 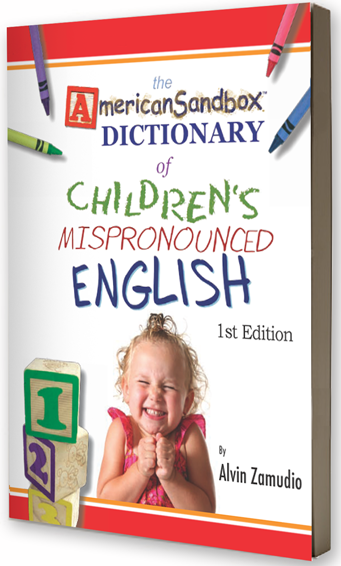 You can find The American Sandbox Dictionary of Children’s Mispronounced English at the Sandbox Shop, on Amazon.com, and other major book retailers for $12.99 or less. Thank you to Reedy Press for providing us with a complimentary sample book to base this review upon.